The concept of AI-Blocs is to have a simple scene with draggable objects that have scripts attached to them. The model can be run directly on the editor or be exported to a standalone script that runs on Tensorflow. 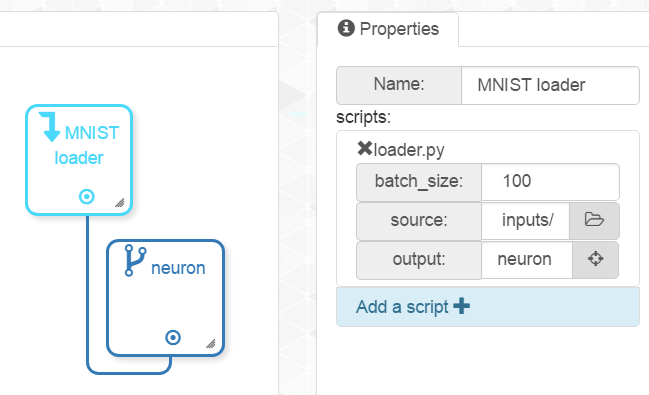 Variables are parsed from python scripts and can be edited from the AI-Blocs properties panel. The project requires python (https://www.python.org/) and tensorflow (https://www.tensorflow.org/) to run projects. You can still create and edit projects without these dependencies. To run AI-Blocs, download the project archive and launch AI-Blocs.exe. To run your model simply press the "Play" button and let the magic happen!